Whether crops, fruits trees, gardens, silage films, orchards, or personal property, the outcome is always the same, mass destruction. The SCARYBIRD System is the ecological answer to this ongoing problem. After simple observation it was obvious that the presence of raptors kept the pest birds away. 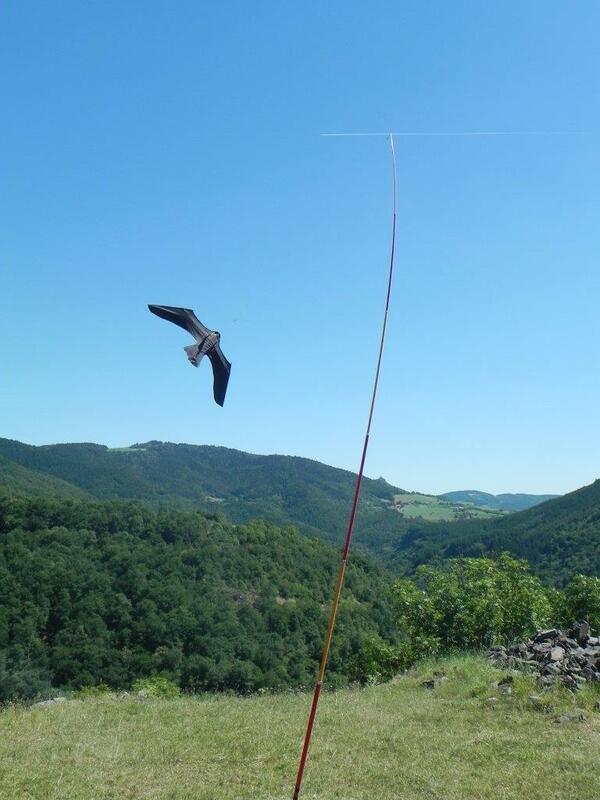 The SCARYBIRD system consists of an eagle shaped kite hooked to the top of a 9 Meters telescopic pole. The heart of the system is a Bird-like raptor (Eagle, Hawk) always altering its flight (Speed, Height) on top of the pole. The shape of the kite is designed to mimic the shape of a predator bird in flight. The colours of the beak and claws make it even more realistic. Unlike fixed scarecrow systems, the scaring device SCARYBIRD flies randomly, swooping and diving with the lightest of winds. The pest birds will not get use to its presence because they see this hunting predator from afar and their natural instincts will take over to get away from danger. Crows, Cockatoos, Parrots, Pigeons, Starlings, Seagulls, Ducks, Magpies and other pest birds. The kits are easy to install taking less than 5 minutes. No chemicals or poisons are required 100% Ecological. Simply move him around. No maintenance required, lightweight. BirdXpeller PRO– Sonic Bird Repeller. The synergy of combining bird scare predator / distress calls with the visual flight of the eagle has had outstanding success to many satisfied customers.